Reading Museum 1 On 25 October 1809, on the occasion of George III’s Golden Jubilee the remaining 200 Danish Prisoners-of-War were given their freedom. Sivert Ryberg, POW, presented this model to the Mayor of Reading. Base – 27 cm length, Base – 16.5 cm wide, Dome – 28.5 cm height. Canada Halifax, NS, Museum of the Atlantic 1 74 gun ship with two gun decks, possibly built by French POWs housed in Halifax. Model at present in the process of being restored. St John's, NL, Canada 1 A Napoleonic Prisoner-of-War Ship Model. The elaborately crafted miniature was created during the French and Napoleonic wars (1793-1815). Made of bone. Ship Shapes of Charleston 2 restored two "prisoner bone ships"
Hamburg, private collection 1 Ship of The Line, circa 1810, 114 guns, HMS "MARS"
Hamburg, private collection 1 Fourth rate warship with 58 cannon and a “pipe smoker” figurehead, made early-19th century. Size: 40 x 32 x 17 cm. Hamburg, private collection 1 Third rate warship with 76 cannon and a warrior figurehead, made early-19th century. Size: 29 x 23 x 7 cm. Hamburg, private collection 1 English brig with 12 cannon and a figurehead, made early-19th century. Size: 48 x 49 cm. The model is rigged without an additional gaff-rigged spanker behind the mainsail. Hamburg, private collection 1 Third rate British frigate with 58 cannon and a warrior figurehead, made early-19th century. Hamburg, private collection 1 The Model measures 36 x 10 x 26.5 cm. 26 guns are mounted in the gun deck, and on the forecastle, quarterdeck. Hamburg, private collection 1 British Third rate warship, a typical 74er with 58 guns in two gun decks, equipment for guns on the quarterdeck (16), the forecastle (6) and the poop deck (6). Royal Danish Naval Museum 1 Third rate warship with two gundecks, 84 cannon and a polychrome figurehead, made by Danish and Norwegian prisoners in Greenlaw near Edinburgh. Hellenic Maritime Museum, Onassis’ collection 13 One model of Nelsons’ flagship, “Victory”, made from bone and under the same conditions as the other models was also added in the collection. This is an older donation to the Museum by A. Koumantareas in 1960. Naval Museum of Oinousses 32 Antonis S. Lemos unique personal collection of Napoleonic boats of 32 precious models made by Nelson’s French prisoners. New Zealand New Zealand Maritime Museum 1 A model of a frigate, carved from bone by French prisoners of war in England during the Napoleonic Wars (1803-1815). Heros 1 Scale: unknown. A contemporary full hull model of the French 74-gun, two-decker ‘Le Heros’ (1770). canvas as protection against the weather. Christie's:$11,353; 10 February 2004 ; New York 1 A Napoleonic Prisoner of War ship model of a French Sloop of War Du Teillay; 26½ x 11 x 19¼ in. (67.3 x 27.9 x 48.9 cm.) cased dimensions. Christie's:$66,000; 31 January 2007 ; New York 1 A large Napoleonic Prisoner of War bone model of 84 gun ship of the line; 26 x 30 in. (66 x 76.2 cm.) model. Bonhams: £69.600; 18 Oct 2005; London 1 A fine and large prisoner-of-war bone model of the first-rate ship H.M.S. "Caledonia", early 19th century, 48x22x67in(122x56x170cm)overall. Bonhams: £3,840 ; 22 Mar 2011 ; London 1 A large 19th century bone Prisoner of War model ship, for restoration. Bonhams: $20,000; 25 Jan 2013 ; New York 1 the hull built up in wood and the topsides planked in bone, with black painted strakes, carved bone hammock nets, the deck detailed with dog houses, companionways, (18) guns on carriages, tiller, capstan, ship's boat and other details. Rigged with masts and spars, standing and running rigging. Displayed on a wood base cut to show her as a waterline model with bone stanchions and frette work. Within a later mahogany and plexiglass case. 14-1/4 x 6-3/4 x 12 in. (36.1 x 17.1 x 30.4 cm.) cased. 10-1/2 x 5-1/2 x 8-1/4 in. (26.6 x 13.9 x 20.9 cm.) cased. length x depth x height. the hull built up from the solid and planked in bone and horn between the gun decks, red-painted gun port lids with brass guns, chain plates and dead-eyes, polychromed figurehead, carved and pierced stern and quarter galleries, the decks detailed with metal anchors, head rails, capstan, pin and fife rails, belfry, well deck, hatch gratings, guns on carriages, ladders, taff rail, and other details. Rigged with masts, yards, standing and running rigging with bone blocks, spars, stun'sail booms, boat rigged out over the starboard side and other details. Displayed within the original marquetry case with glazed front and sides, drop down front and and mirror at the back, with bone finials and feet. 13-3/4 x 5-1/2 x 12-3/4 in. (34.9 x 13.9 x 32.3 cm.) cased. length x depth x height. the hull built up in wood and the topsides planked in bone, with black painted strakes, carved bone hammock nets, the deck detailed with dog houses, companionways, (18) guns on carriages, tiller, capstan, ship's boat and other details. Rigged with masts and spars, standing and running rigging. Displayed on a wood base cut to show her as a waterline model with bone stanchions and frette work. Within a later mahogany and plexiglass case. Bonhams: £30,000 ; 24 Apr 2013 ; London 1 An impressive 19th century Prisoner of War bone model of a 50 gun ship. Hull of pinned bone planks on a wooden core, with baleen wales, pierced for 50 turned brass cannon on bone carriages. Finely carved figurehead, trail boards, stern and quarter decoration. Laid bone plank decks, with detailed gratings, windlass, belfry, water butts, wheel and binnacle, skylight and companionway. A ship's boat on skids amidships and another slung on davits astern. Bone spars and very finely detailed running and standing rigging. Mounted on crutches on a parquetry baseboard, in glazed display case. The model 30ins. (76cm)long. possibly Le Maroc [name on transom barely legible], the hull built up from the solid and planked in bone, between the gun decks are raised bone strakes which were painted black, brass guns fitted to the topsides and decks, chain plates and dead-eyes, polychromed figurehead of a warrior, carved and pierced stern and quarter galleries with verdigris copper details, head rails, pin and fife rails, scored planking for the decks, open well deck, guns on carriages, taff rail, and other details. Rigged with masts, yards, standing and running rigging, spars, stun'sail booms, and other details [rigging in need of attention]. Set into a bone and wood base with a painted sea [distressed] giving the impression of a waterline model. Displayed within a glass and mahogany framed case. 15 x 7-1/2 x 12 in. (38.1 x 19.1 x 30.4 cm.) cased. in a diorama format with the hull built up from the waterline, a painted green bottom, the topsides painted in alternating bands of black, pink and white, and black topsides fitted with a figure head of a Roman warrior, at the stern the quarter galleries and transom are modeled with windows, cut and pierced and decorated with a geometric pattern. The decks are of veneer with the planking lines drawn in and detailed with: anchor, cannons on carriages, pin and fife rails, capstan, railings, ladders, belfry, hatches, deck eyes. At anchor, one anchor rode is run out into the sea as if the ship were anchored. Rigged with three masts, bowsprit, standing and running rigging, turning blocks, cross spars, tops and trees, and dead-eyes and other rigging details. Displayed on a carved and painted sea, framed by an ornately decorated and drawn acanthus base, within a mahogany and glass case with carved front columns and a foliate frieze over the top. 15 x 7-1/2 x 14-3/4 in. (38.1 x 19.1 x 37.5 cm.) cased. the hull built up from the solid and planked in bone with ribbed details between the gun decks, red-painted gun port lids with darkened brass guns, chain plates and dead-eyes, carved figurehead, carved and pierced stern and quarter galleries, the decks detailed with metal anchors, head rails, capstan, pin and fife rails, belfry with bell, well deck with railings, hatch gratings (possibly replaced), guns on carriages, ladders, taff rail, and other details. Rigged with masts, yards, standing and running rigging with bone blocks, spars, boat rigged out over the well deck and other details. 18 x 8-1/2 x 14 in. (45.7 x 21.5 x 35.5 cm.) cased. built up over a wood plug, planked in bone, with stem, keel and rudder post, with double bands of ebony running between the gun ports, head rails supporting a carved figurehead of a maiden, built up bulwarks in bone, the decks detailed with anchors, anchor posts, deck eyes, fife rails, stove pipe, deck gratings, capstan, ships wheel, three boats hung out on davits and another amidships, decorated quarter galleries, transom with double balcony, and other details. Rigged with a bow sprit, three masts with spars and stun'sail booms, standing and running rigging, flags and other details. Displayed on a mahogany baseboard within a mahogany framed glass case. Bonhams: £4,250 ; 15 Apr 2014 ; London 1 the hull built up from the solid and planked in bone secured with brass pins, and blackened strips of wood at the waterline and between the gun decks, red-painted gun port lids with brass cannons, chain plates and dead-eyes, carved figurehead of a horse and rider, carved and pierced stern and quarter galleries, the decks detailed with blackened metal anchors, head rails, pin and fife rails, belfry with bell, well deck with capstan, railings, hatch gratings, guns on carriages, ladders, taff rail, and other details. Rigged with masts, yards, stun' sail booms, standing and running rigging with bone blocks, a single boat rigged out over the well deck and other details. 31-1/4 x 11 x 22-3/4 in. (79.3 x 27.9 x 57.7 cm.) cased. There was a French 38 gun Frigate in the French Navy called the Diane. Built at Toulon in 1796, she fought at the Battle of the Nile, escaped and was captured at Malta in August 1800. Re-commissioned in the Royal Navy as HMSNiobe, she was sold out of the service in 1816. Bonhams: £5,625; 15 Apr 2015; London 1 A Napoleonic period bone model of a 60 gun ship. 14 x 7-1/2 x 12-1/4 in. (35.5 x 19 x 31.1 cm. ), cased dimension. Bonhams Science and Marine21 March 2007 Lot 229 1 A bone prisoner of war model of First Rate warship 30,5 X 12 X 25,5 cm. Christie's Maritime Models 16 May 2007 Lot 239 1 A finely restored early 19th century napoleonic french prisoner of war model of a second rate 90 gun ship of the line 84 X 99 cm. Charles Miller Maritime Models: £18,000 ; 17 July 2008 ; London ; Lot 117 1 A finely detailed and well presented early 19th century napoleonic french prisoner of war bone and baleen model of a 80 gun ship second rate of the line 23 X28 cm. Charles Miller Maritime Models: £21,600 ; 29 April 2009 ; London ; Lot 283 1 A finely detailed Napoleonic prisoner of war bone and baleen model of an 80 gun third rate ship of the line, contained within a mirror lined straw work display case of large size 25,5 X 30,5 cm. Charles Miller Maritime Models: £14,400 ; 27 October 2010 ; London ; Lot 312 1 A finely restored early 19th century Napoleonic French prisoner-of-war bone and baleen model of the 90 gun 2nd rate ship-of-the-line 40,5 X 53,4 cm. Charles Miller Maritime Models: £13,200 ; 27 October 2010 ; London ; Lot 314 1 A finely restored early 19th century Napoleonic French prisoner-of-war bone and baleen model of the 100 gun 1st rate ship-of-the-line28 X 30,5 cm. WEST SEA COMPANY, San Diego CA , USA 1 Genuine turn of the 19th century (circa 1800) ship model constructed by French prisoners, 96 gun ship of the line, the model itself measures 10 inches long overall and 9 1/2 inches high. It is housed in an antique Georgian domed glass case on a crotch mahogany base 13 1/2 inches long and 14 inches high. HAP MOORE ANTIQUES: $12,320 ; 21 March 2009 ; York, Maine, USA 1 Napoleonic Prisoner of War bone ship model of the H.M.S. Glory. coloured straw, also made by prisoners-of-war. Furnished with mirrored back panel to inspect the far side of the model. Minor defects. 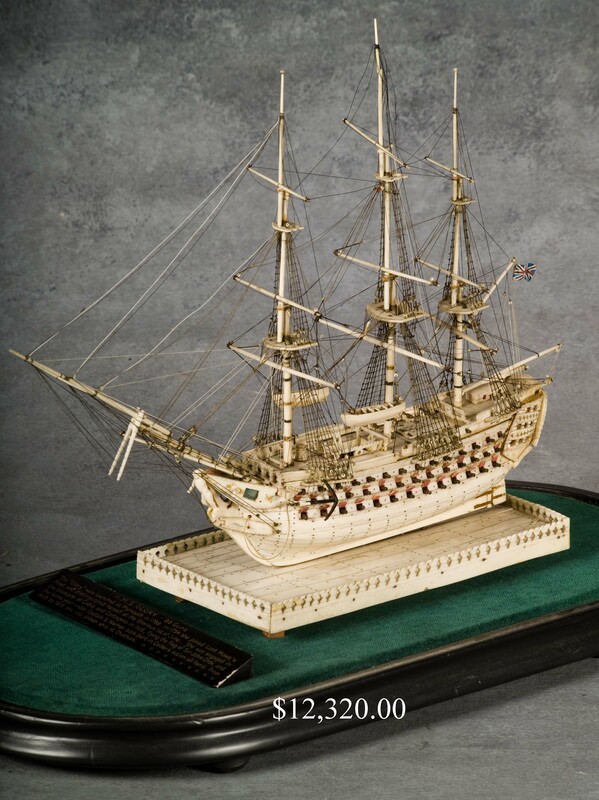 1 Napoleonic Era Warship Model made by French POW in ivory and baleen, depicting a 54 gun Ship of the Line, circa 1800. With planked and pinned hull, carved stern and quarter galleries, figurehead, two long boats, both anchors, figure on deck, three fully rigged masts and bowsprit, mounted on an inlaid marquetry wood base. In a mahogany and glass case. The ship itself is 15" x 18" x 3- 1/2", the case is 20" x 22" x 8- 1/4". Fine condition. NOTE: Features spring-loaded retracting cannon, actuated by chains coming from stern. James D. Julia, Auctioneers; February 9th & 10th, 2017 1 NAPOLEONIC WAR PRISONER OF WAR BONE SHIP MODEL OF THE H.M. FRIGATE “SIBYLLE”. The all bone carved model depicting the three-mast 40-gun ship with all it’s rigging and accessories. Mounted to a block of wood surrounded by a four post bone surround. The whole mounted on a walnut slab with four small ivory feet and having a painted presentation plaque. A modern metal edged & glass presentation case. SIZE: Boat: 9-1/4″ h x 11-1/2″ l. Case: 12-1/2″ h x 16-1/2″ w x 7″ d. PROVENANCE: From a Maine/Texas estate being sold unreserved. James D. Julia, Auctioneers; February 8 & 9, 2018 1 NAPOLEONIC PRISONER OF WAR BONE MODEL OF A 48 GUN FRIGATE. 1st quarter 19th century, England. This small model most likely made by French prisoners during the Napoleonic Wars while captive in Great Britain. Mounted in a domed glass case. The 3-masted frigate with planked bone decking and hull of pinned construction mounted with 48 guns on two decks. Model made with twisted silk or baleen strung rigging with well detailed fantail and female figurehead. Note: The war between Napoleon’s French Navy and the naval forces of England lasted so long that the captured French prisoners had to find ways to pass the time. Although the British did not treat them as convicts, they were confined to prison hulks, old castles or purpose built prison camps such as Dartmoor. Their captors encouraged the prisoners to form their own groups or guilds to produce small objects of art to sell in the camp’s civilian markets. Among the most popular were ship models that they created representing British naval ships of the period. French prisoners of war obtained beef and mutton bones from the food rations issued to them. After gathering bones for use in model building, prisoners boiled the bones and bleached them in the sun, to make the bones easier to shape and carve. In addition to cattle and mutton bones, prisoners made use of their own hair to fashion sail rigging, and tissue paper to create sails. SIZE: Model: 14″ h x 15-1/2″ l. Dome: 16-1/2″ h x 17-3/4″ l x 8″ approx. w. PROVENANCE: Contents of a lifetime collection “Brook Crossing,” South Pomfret, VT. CONDITION: Glass dome and velvet covered base original and in good condition. The model is sound. Rigging generally complete. One area of rigging in disrepair on main mast beneath top gallant spar. Generally very good overall. Recently found in the attic of a country house in Southern Ireland, family hearsay places the model to a mid-19th Century naval officer ancestor and it’s thought to have been in the attic for over 100 years. Whilst the model superficially looks in poor condition, it retains nearly all its original fittings and parts, and whilst much of the running rigging will need to be replaced, the standing rigging is in good condition.